The United States Lavender Growers Association was formed to support and promote the United States Lavender industry. The USLGA allows a collective voice for lavender growers in the U.S. It supports lavender farms, connect growers to buyers and provide continual education for both lavender growers and lavender users. The long term goal of USLGA is to provide a quality lavender crop, essential oil and distillates to satisfy U.S. needs for these products and for the U.S. lavender industry to be recognized as a global leader providing education, research and support. Our mission is to support and promote the United States lavender industry through research, education, networking and marketing. The USLGA thrives with members who are passionately involved with lavender. 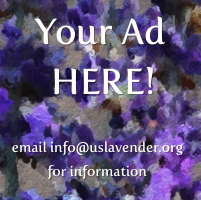 Join us to support and promote the United States Lavender industry.